social needs of Staten Islanders. 8:00 pm and Shabbat mornings beginning at 9:00 in our historic 1907 sanctuary. Our junior congregation service meets monthly, on the first Shabbat morning of the month at 10:30 in our adjoining educational building. We also co-sponsor a morning minyan, open to men and women, held on Tuesdays, Wednesdays and Fridays at 7:20 am in our sanctuary, and on Mondays and Thursdays at 7:20 am, and on Sundays at 9:00 am, at our neighbor, Congregation B’nai Jeshurun. Clubs, Hebrew School and additional programs. Members are also encouraged to serve on our various temple committees. 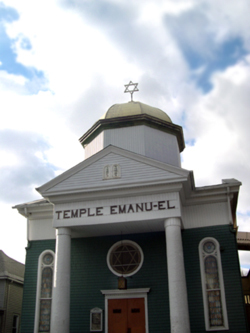 Temple Emanu-El is also active in the wider Staten Island community.We host the Jewish War Veterans, host events for the Staten Island Jewish Historical Society and are the founding organization of Staten Island Community Days. The Staten Island Council of Jewish Organizations (COJO) food pantry operates from our building. please call the Temple office at (718) 442-5966.